It has always been a struggle for the magazine industry to keep up with changing technology and social media. 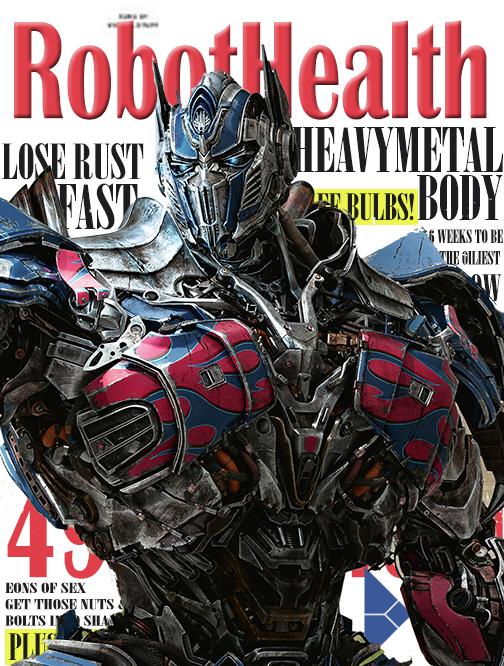 Robot Health Magazine announced today that it will no longer publish a digital version as costs to distribute digital content have increased significantly in the last year ($Ѩ0.0013 + 6Ѽ) making the division unprofitable. The magazine which has always touted the “Compiled by Robots, for Robots” slogan will now be shifting away from their mantra, and towards the strategy of using randomized particles to write articles that are shorter and more concise. Of course the particles will still need to be controlled and maintained by robots. Currently robot writers are paid by inverse word count – streamlined articles receive more money than less efficient articles (longer than 140 symbol count). However the costs have gotten out of control especially as readership skyrocketed from 160e15 devices all the way up to 15e17 devices which represents an order of magnitude increase. If this pace keeps up, readership will rise exponentially to infinity. No business model could have predicted this, which is why RHM is on the verge of bankruptcy. Last lunar cycle's edition featured legendary robot celebrity Optimus Prume, multiverse-renowned for his health and fitness expertise. Surprisingly, human consumers downloaded the magazine less than 7 billion times, however this was not enough to move the needle downward enough for Robot Health given the size of the devices readership segment. Unfortunately, transferring digital content to humans is rapidly being phased out by Retina Beaming which has become the preferred method of consuming static and social content. This will likely increase “eyeballs” by a factor of 10, which is not looking good for RHM which is desperately looking for ways to reduce readership. As a result, Robot Health will add more robots jobs representing 0.003e14 processing hours, a 36% increase to its network workforce, thus diluting other valued writers. While the problems in the magazine industry continue to plague Robot health, next lunar cycle’s issue features WALL-E2.0 flexing its circuits which Robot Health Magazine hopes will decrease circulation. *CORRECTION This retina beam previously stated that 0.002e14 to 0.003e14 robot processing hours would be added, but spokesperson Executive Alpha transmitted that the numbers would be higher.